Sham Shui Po is the poorest neighborhood of Hong Kong. Here, a group of inhabitants and shop keepers threatened with eviction are fighting for their buildings by designing positive forms of action. Initially, when the government announced that their shops and houses were slated to be demolished, the people of Sham Shui Po felt intimidated. Several signed contracts they did not understand, offering them compensation for leaving their loved and lifelong homes. The compensation was paltry and those who moved, experienced a lower living standard than before and missed their friends and livelihoods. Their stories inspired Chau Yee Mei, a young lady who had grown up in the neighborhood, to organize the remaining inhabitants around an attempt to convince the authorities of their plight. Traditional activists would have launched a protest, but since protestors are quite unpopular in Hong Kong for their negativity, Chau Yee Mei chose a different approach: happy action. She was moved by the stories the people from Sham Shui Po told her, and curated an exhibition of large scale banners on which these stories were translated into illustrations. Visitors to the exhibition were given an explanation by the people depicted on the banners. When government officials aired criticism of the banners, the press got interested and gave ample attention to the people of Sham Shui Po. Recently a new happy action took place to draw the attention of Mrs. Lam, the head of city development in Hong Kong and therefore the one responsible for the future of Sham Shui Po. 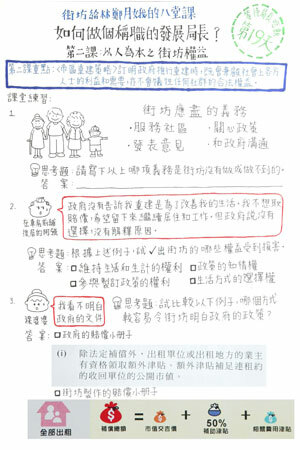 The inhabitants resolved to tell Mrs. Lam why it is important for them to retain their current buildings. They didn’t want to treat her as an enemy, but as an intrinsically good person trying to do her best job as a politician. So they got together for dinner every night for a fortnight at a local garage. 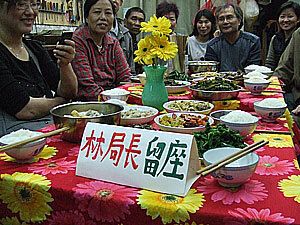 There, dinner was served and a plate was set for Mrs. Lam, with a sign saying this was her place. Several newspapers wrote about the action and government officials stopped by to take photographs… but Mrs. Lam didn’t appear. 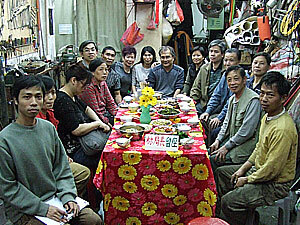 Visit the Kai Fong (neighbors) blog.